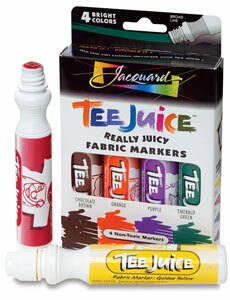 Use these free-flowing, broad-line fabric markers on T-shirts, jeans, canvas, and cotton fabric. They’re loaded with color that flows as you need it, and are ideal for filling in larger areas — just squeeze to increase the color flow. Jacquard's brilliant, lightfast colors stay strong after repeated washings. Blend colors by adding one on top of another. Heat-set by ironing after the color dries. With a round tip that won’t snag on T-shirts or other fabrics, application of color is easy for all ages. Set of 4 Broad Point, Bright Colors — Includes one each of Brown, Green, Purple, and Orange. Set of 5 Fine Point, Primary Colors — Includes one each of Red, Yellow, Blue, Green, and Black. Set of 4 Broad Point, Classic Colors — Includes one each of Yellow, Red, Blue, and Black. Tattoo Colors Kit — This kit contains 8 iron-on transfers in multiple sizes and 5 fabric markers. It includes one medium point marker each of Orange, Red, Green, and Purple, and one fine point marker in Black. Aquatic Colors Kit — This kit contains 8 iron-on transfers in multiple sizes and 5 fabric markers. It includes one medium point marker each of Orange, Yellow, Green, and Blue, and one fine point marker in Black. Floral Colors Kit — This kit contains 8 iron-on transfers in multiple sizes and 5 fabric markers. It includes one medium point marker each of Yellow, Red, Green, and Purple, and one fine point marker in Black. Set of 5 Medium Point, Primary Colors — This set includes one medium point marker each of Red, Yellow, Blue, Green, and Black.